What caught me right away about this book was the title, Anna Dressed in Blood. Rather morbid, huh? I was looking for something along the lines of a ghost story, something genuinely scary and not some fluffy star-crossed romance. Well, with a title like that, I was assuming there wasn’t anything fluffy about it. Anna Dressed in Blood is about Cas, a teenage boy, who hunts and kills deadly ghosts. After his father died a savage death from a very powerful ghost, Cas took up his father’s profession of ghost hunting. For years, Cas has been on the move with his mom, following tips to where deadly ghosts are haunting and killing the living. He finally moves to Thunder Bay, Ontario when he receives a tip about a ghost called Anna Dressed in Blood. Instantly, Cas feels some unexplained connection to this powerful ghost, something he might suspect links to his father’s death. Killing Anna becomes harder than he first thought when he unintentionally involves some new schoolmates in his mission. First off, this was probably the scariest YA book I have ever read. Keep in mind though, that 1. I don’t read or watch many horror books and movies and 2. I’m a wimp. Regardless, there were well-executed moments of suspense throughout the novel. Author Kendare Blake picks up the pace at the right moments. Also, Anna isn’t just some wimpy ghost girl. She’s powerful and can’t be controlled. It isn’t exactly Anna that makes the story scary, but the vivid and violent descriptions Blake gives. I couldn’t gloss over the imagery in my mind. I was sitting in my bed around midnight, afraid to go to sleep, imagining shadows moving in the corner of my eye. It took me, like 15 minutes to get the nerve to turn off the light. Yes, I’m very much a wimp. The story and characters were interesting. I was expecting the story to be predictable. I was surprised by how much it wasn’t. The story takes twists and turns that I didn’t anticipate at all. As for the characters, I like Cas, he’s sarcastic and smart. I enjoy how he interacts with people. His new friend Thomas makes a good sidekick for his ghostbusting missions. I particularly like how the author turned Carmel, the most popular girl in school, into someone with substance. She could’ve just used her as the typical “mean, popular girl” that the lead only uses to get whatever information he needs. I liked that she became one of Cas’ confidants and sidekicks. We need more cool tough girls in YA lit. 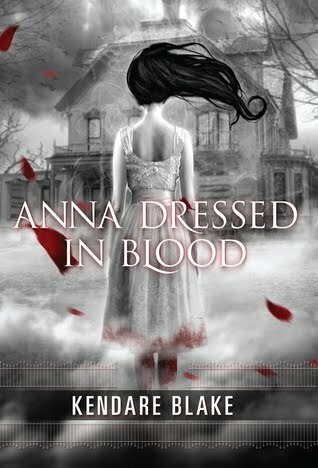 Anna Dressed in Blood is definitely a good scary read. Maybe it won’t scare you as much as me, but I’m sure you’ll find it as entertaining as I did. This is the first of a series of books. I believe the sequel, Girl of Nightmares, comes out sometime in 2012. I’ll be patiently waiting until then. Support our site and purchase Anna Dressed in Blood from our TYF Store!